It’s one of the best contests of the weekend when the 3-1 Miami Dolphins travel to Ohio to take on the 3-1 Cincinnati Bengals. These two teams are leading their divisions, as Miami is the top team in the AFC East and Cincinnati is the top team in the AFC North. These two teams have not faced each other since 2016 when Cincinnati one 22-7. The Dolphins lead the all-time series 16-6. The New England Patriots rolled over the visiting Miami Dolphins, 38-7. Miami put up just 172 yards of offense, including only 116 on the ground, and Tom Brady threw for three touchdowns as the Patriots crushed the Dolphins. New England led by three coming out of the first quarter but would add three touchdowns in the second. The first came on a 55-yard strike from Brady to wide receiver Cordarrelle Patterson to extend the lead to 10. James White would then at a 22 yard run for a touchdown, and Brady would end the half with a touchdown to Philip Dorsett with 18 seconds left to give New England a 24-0 lead. In the third quarter, Brady would throw his third touchdown pass of the game, a 14-yard completion to James White, and the Patriots would extend their lead to 38 when Sony Michel scored from 10 yards out. 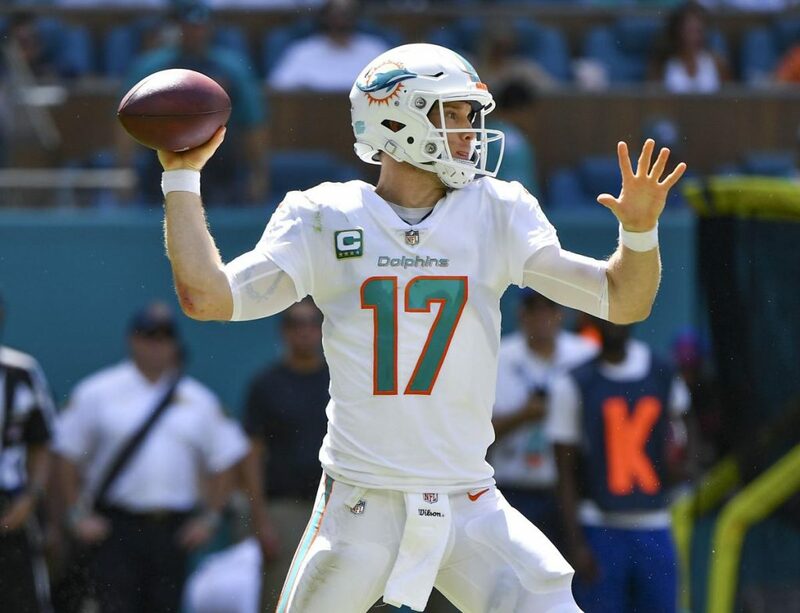 Brock Osweiler took over for the struggling Ryan Tannehill and tossed a 6-yard touchdown pass with 2:42 left in the game to complete the scoring. The Dolphins’ offense has been atrocious to the season, ranked 30th in the NFL in yards per game at 286.0 and they are 26th in points scored at 20.5. The defense has not been much better, allowing 395.2 yards per game, 26th overall, and they are 14th in points allowed and 22.5. In what was the most exciting game of Week 4, the Cincinnati Bengals and Atlanta Falcons put up 902 yards of offense and 73 points in the Bengals 37-36 victory. Quarterback Andy Dalton completed 70.7% of his passes for 337 yards and three touchdowns and the Cincinnati defense recorded three sacks in the contest. Giovani Bernard scored two touchdowns for the Bengals. After Atlanta took the lead a little less than five minutes into the contest, Cincinnati would score the next 14 points on a 15-yard touchdown pass from Andy Dalton to Tyler Eifert and a 10 yard run for a touchdown by Giovani Bernard. That gave the Bengals a 14-7 lead at the end of the first quarter. The second quarter would be a while the fair, as 31 points were scored. Atlanta would tie the score before Dalton connected with Jon Ross for a 39-yard touchdown to put Cincinnati back on top by seven. Once again, the Falcons would tie the score, but Bernard would put his team back on top with a 1 yard run for a touchdown. Matt Bryant connected on a 55-yard field goal as the half was ending, cutting the Cincinnati lead to four. Atlanta would get a feel goal is the only points in the third quarter and would retake the lead on a Matt Ryan touchdown. That gave Atlanta a five-point lead. The two teams would exchange field goals, setting up the dramatic ending. Dalton led his team to victory, capping off the drive with a 13-yard strike to A. J. Green to put the Bengals up by one. Atlanta cannot capitalize in the last 22 seconds as the Bengals won 37-36. The Cincinnati Bengals offense is 16th in the NFL in yards per contest at 376.5, but they are fourth in scoring at 31.5 points per contest. The defense is 29th in yards allowed at 419.2 and they are 23rd in points allowed at 28.2. 5-2 ATS in their last seven Week 5 contests. 3-8 ATS in their last 11 games against teams with a winning record. 5-16 ATS in their last 21 games on Astroturf. 1-6 ATS in their last seven games on the road. 7-0 ATS in their last seven games against AFC teams. 5-1 ATS in their last six games against teams with a winning record. 5-1 ATS in their last six games overall. The Dolphins got exposed against New England last weekend, which isn’t anything to cry about considering how good the Patriots have been over the last 20 years. However, this is Cincinnati team that is firing on all cylinders. That’s bad news for the Dolphins despite the fact that they are 4-1 ATS in the last five contests between these two teams in Cincinnati. The Bengals are just too good. The total for this contest is set a bit too high, as Miami is having difficulty scoring. Cincinnati is likely to come up with 31 points, but expect Miami to score no more than 16.